Bagi anda yang baru mendengar istilah Black Hat SEO mungkin akan bingung apa sih yang dimaksud dengan Black Hat SEO itu ..? black hat SEO adalah memberikan halaman yang berbeda antara yang diminta oleh search engine dengan halaman yang akan ditampilkan untun pengunjung. Metode terkahir ini dikenal dengan sebutan cloaking. Black Hat SEO berusaha menaikkan peringkat sebuah website dengan cara yang bertentangan dengan ketentuan dari search engine, atau melakukan kecurangan. Salah satu teknik black hat SEO adalah menyembunyikan teks dengan cara membuat warna teks serupa dengan warna background, menyimpan teks didalam div invisible kode HTML, atau memposisikannya di luar layar. Search engine akan menjatuhkan hukuman pada website yang menggunakan black hat SEO, dengan menurunkan peringkatnya atau mengeluarkannya dari dalam database. Hukuman ini dapat dijatuhkan kepada website-website nakal secara automatis, dengan menggunakan algoritma tertentu atau berdasarkan laporan dari pengunjung yang merasa tertipu. Apakah Black Hat SEO adalah strategi ? Menurut saya orang yang menggunakan black hat seo adalah orang yang putus asa karena blog atau webnya tidak kunjung naik ranking alexa atau tidak mendapatkan PR dari Google, atau orang yang tidak paham tips trik SEO dan ingin cepat mendapatkan trafic tinggi dengan jalan pintas atau jalan haram tadi. Jadi bagaimana solusi belajar SEO yang baik ?? Belajarlah dari Master-master SEO di dunia ngeblog ini, saya tidak usah sebutkan satu persatu siapa master SEO, saya sendiri juga bukan seorang Master SEO, saya hanya belajar dari para master-master lainnya. Most clients who are trying to get a webpage started, or to better manage an existing one, have heard of shared hosting services, (also known as virtual server hosting), or dedicated server hosting. Correspondingly, at some point in their company or small business’ development, they question which is best for their website. To answer that question they should first be clear on what they are, the requirements they will need to cover, and their available options. Virtual server hosting has a variety of different websites hosted on it, each one being managed by the server’s administrator. The server shares its resources with all of these sites, including bandwidth and data storage. A shared website may use reseller hosting. Dedicated server hosting has only one website which has its own IP address. 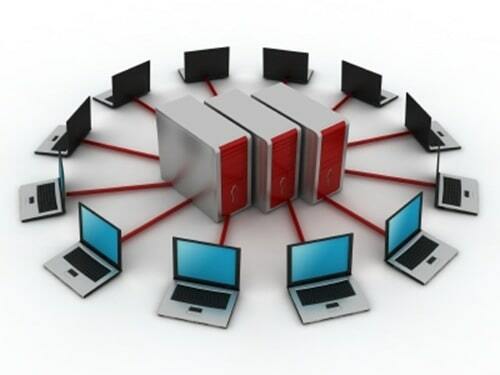 Therefore, this server allows its clients full use of its server resources. Many businesses begin with shared server host agreements and find that they later need to upgrade to dedicated server hosting. For this reason it is a good idea to have in mind what kind of internet traffic is expected, how much control will be needed with webpage management, setup, and loading speeds. More control to manage is a big plus to dedicated server hosting. There is nothing more annoying that having to worry about a programmer writing crazy script that slows down, or crashes the server – taking your webpage with it. With dedicated server hosting there is full client control to make sure that their site is stable and operating adequately, and to go in a make any changes that may be needed without worrying about any program restrictions or limitations imposed by virtual server hosting. One of the best features of having a website hosted by a dedicated server is the absence of bandwidth throttling that is obligatory on shared servers due to the sheer number of website that have to be managed and regulated in order to keep the server from crashing. Dedicated servers have only one client on them. Therefore, that client is free to use all of the server’s allotted bandwidth. Many people skip a page that they find while surfing because a page takes too long to come up. An added benefit of unlimited bandwidth use is that the webpage loads faster, even when internet traffic loads are high. Since there is only one client on the server, there is no need to limit speeds (or storage space), and website response time is quick. The fact that server setup is easier with dedicated server hosting is another reason why they are preferable. Since the server has a dedicated IP address it is simple to set it up to manage anonymous FTP and SSL (secure sockets layer) encryption. This is a process that is much simpler to do with a dedicated server than it would be with virtual server hosting. Most virtual server hosting services are responsible for managing the websites on them, which can have a detrimental effect on individual site security. Security is not compromised with dedicated server hosting, because there is only one site and it is managed by the client. Some companies offer ecommerce hosting, windows hosting, Linux hosting, vps, among other hosting options. To decide which company is best suited to these particular areas, it is best to consider the information on their webpages and research their client responses. Some of the most popular dedicated server hosting services are, In Motion, Single Hop, Dedicated Now, and Hosting Source, and others can be found using an internet hosting service search engines. With the above information any client is equipped to search out the right dedicated server hosting service that will be exactly what they are looking for to care for their needs. Search engine optimization, or SEO, doesn’t have to be scary. It can be fun and exciting to put these WordPress SEO tips to use and to watch your blog begin receiving targeted visitors from people who are actively searching for exactly what you have to offer. What are the keys to building a successful presence on the search engine results pages? What are the most important SEO factors for getting your site discovered by Google’s search bot and how can we get in on the action? So you’re looking for the best SEO tips for WordPress necessary to get your website noticed by Google? Look no further. Take your time. Exam the ideas below and then transform the effectiveness of your WordPress website. So without further ado, I’m very pleased to share with you 15 of the best SEO tips for WordPress in 2011. Let’s make this year our best year ever. Create Amazing Content: You’ll probably want to viciously punch my hansom face for leading this list with such a clichéd topic, but it’s undeniably true and far too many of you are still failing to produce material that truly appeals to your viewers. If you were producing something amazing, the world would be beating down your door trying to get to it. Link to Amazing Content: It’s always a good idea to point your users toward resources on other websites that will be helpful for them. It shows security as a thought leader in your niche when you’re willing to suggest to your readers that they leave your site, and search engines favor sites that link to other websites that it views as both generally authoritative and relevant to your articles. Special Note: Don’t link to other sites with the hope of getting something in return. Find resources that are genuinely helpful and share them with your readers. People will respect you for it. Sprinkle Your Keywords Throughout Your Articles: The term keyword refers to the word or phrase that you hope to be listed for on Google search. Once you’ve identified a term that you’d like to be listed for, be sure to use that term a few times throughout your article. Do this is small portions, because if you do this too much you’re a spammer using a tactic that we refer to as keyword stuffing. Use Your Keyword in the Title: This is one of the strongest ways to get listed for a search term. However, it is again incredibly important to remember that you must not practice keyword stuffing. Only put your keyword in the title if you’re able to make it sound fun, exciting and engaging to your readers. You don’t have to sacrifice your quality to implement this or any of these 15 SEO tips for WordPress. Enable Trackbacks: Trackbacks are a neat system that allow links to be created in your comments section to anyone who links to your articles. With them enabled, it’s a great way to encourage people to link to you which in turn will help to build your site’s authority. Optimize Images In Your Posts: When you can illustrate your topics and articles with attention grabbing artwork or photography people are more likely to view your content. I personally use Flickr’s Creative Commons Search to find excellent photography. As you work to do that, be sure to use image titles and alt text that adequately describe both the image and the content of the article. Provide a Google Sitemap: Google likes it when you provide them with an easy-to-read overview of all the pages on your site. The easiest and most effective way to deliver this much needed SEO tool is to simply install the WordPress plugin called Google XML Sitemaps. This plugin will do all the hard work for you and automatically update every time you add new posts to your site. Customize Each Post’s Slug: When you are writing your article, the ’slug’ field that is located just below the title of the article will determine the website address of the article. So if I enter ‘5-crucial-tips-for-wordpress-users‘ for the slug then the website address of this article will behttp://www.sitesketch101.com/5-crucial-tips-for-wordpress-users. Search engines that see that your website URL’s have the same keywords as your meta description, title, keywords and your content will be seen as being even more consistent. Interlink Keywords Between Articles: Internal links are a powerful way to let Google know what your articles are about, and they’re a terrific way to increase page views across your site as they invite your readers to click through to read other articles. Do you interlink your articles? You should. Provide Valid XHTML Code: There are, in fact, several reasons that you should take the time to validate your website to the standards of the World Wide Web Consortium. If you know anything about the basics of html then getting started won’t be difficult. Simply click through to the W3C Validator, type in the name of your website, and then follow the instructions that it provides you for resolving each issue. Advanced: Although Google clearly states that they will not dock a website for invalid code, you won’t ever have to worry about them missing anything if your site is semantically accurate. Cache Your Blog’s Content: WordPress is a php based system that generates pages on the fly. In other words, your home page doesn’t actually exist. It is created fresh every time someone tries to load it. WordPress looks at a database full of variables which include the articles, the post titles, the sidebar widgets and everything else and compiles them into a page and then delivers it based on the settings and options that you’ve chosen in the control panel. WP Super Cache and W3 Total Cache are WordPress plugins that allow that generated page to be stored as a real static page so that the next person to view it doesn’t have to wait for it to be created. This drastically reduces the time it takes a viewer to see your pages and increases the possibility of keeping more readers. This means that your content will always be lightning fast. Recycle Old Posts and Revive Old Permalinks: The art of recycling an old post simply means that you take an article that was previously published, let’s say five or six months ago, and add new life and excitement to it and republishing it. If you want to keep growing the ranking authority of your most powerful articles from last year then be sure to leave the permalink alone. This allows you to bring in a fresh wave of links to a page that already ranks in Google. Note: For more information on implementing this principle successfully, check out How to Effectively Recycle Old Blog Posts. Link to Related Posts: My final piece of advice is to install WordPress Related Posts Plugin and begin linking to 4 or 5 similar articles at the bottom of each article. This is both a terrific way to guide your readers to more of your articles on similar topics and it’s a terrific way to guide search engines around your site. Scribe – SEO Made Simple: If you’re looking for an easy way to optimize your posts and pages on WordPress, Scribe is your answer. Bloggers and webmasters are constantly wondering why Google is such a bully to some websites and why they are so positive toward others. Begin putting these SEO tips for WordPress into practice and you’ll be able to stop wondering. Special Note: Within 12 hours of publishing this article, it ranked on the first page for the phrase SEO Tips for WordPress. I won’t pretend to be an expert at search engine optimization, but it’s always a great feeling to see my work validated that quickly. Kesalahan dalam menerapkan SEO memang wajar terjadi, apalagi berkaitan dengan masalah optimasi, sangat ragam sekali dan banyak yang harus dilakukan. hal ini tentu menjadi sesuatu yang sangat mengesankan bagi para blogger newbie seperti saya ketika apa yang selama ini saya terapkan ternyata tidak sesuai bahkan terdapat kesalahan, justru hal itu membuat saya semakin penasaran dan mencari kebenaran dari kesalahan tersebut. Kesalahan ini bisa berakibat fatal, biasa saja bahkan sangat fatal. hal ini perlu dihindari agar sesuai dengan yang diharapkan. sedikit share dari saya, bahwa ada 5 kesalahan dalam optimasi SEO. masih banyak referensi yang menunjang untuk melengkapi artikel ini, namun 5 kesalahan ini adalah jenis-jenis kesalahan yang sering terjadi dalam optimasi SEO. Kesalahan untuk mengoptimalkan seo akhir-akhir ini sering sekali terjadi, sebelum melakukan optimasi SEO, tidak ada salahnya jika sobat sekalian membaca teknik SEO yang salah dibawah ini, karena diperkirakan tidak sedikit blogger yang mengacuhkan teknik SEO-nya dan hanya berfikiran optimasi-optimasi dan optimasi tanpa mempertimbangkan sisi buruknya, mungkin untuk para newbie seperti saya ini sangat memerlukan bantuan para seo master yang ada didunia maya. setelah diperhatikan, saya sering sekali melihat banyaknya Teknik SEO yang dipakai dan diposting oleh para blogger tapi apakah anda sudah teliti melihat dan memilah-milah mana teknik SEO yang baik untuk blog anda? jika sobat tidak ingin terjadi kesalahan maka tidak ada salahnya untuk membaca artikel yang berdasarkan pengalaman dan didapat dari beberapa referensi. Kurang mengoptimalkan keywords. Keywords meupakan struktur yang sangat penting dalam SEO, jadi jika kita kurang memaksimalkan penggunaan keyword dalam konten usaha optimalisasi SEO tidak akan mendapatkan hasil seperti yang diharapkan. Sangat disarankan agar menggunakan keyword yang ditempatkan dalam konten, tentunya keyword yang mengandung makna dan mencakup keseuruhan isi artikel, tidak asal “keyword bombing“, termasuk menggunakan huruf tebal atau memberi highlight. Pastikan juga tidak hanya mengulang-ulang keyword yang sama, namun juga mengkombinasikannya dengan kata yang berhubungan dengan keywords dalam artikel yang lainnya. Memilih Keyword yang Salah/Keyword yang tidak tepat. Mungkin sobat menulis artikel yang bagus mengenai “Pasang Emotion Smile di Kotak Komentar“, namun pengunjung mungkin mencari “Pasang Emotion Smile di Blog”, tapi tidak menemukannya dalam artikel anda. Jelas artikel anda tidak akan muncul dalam hasil pencarian search engine. Mengikuti tren keyword dan kombinasi kata sangat penting untuk mencapai kesuksesan menerapkan teknik-teknik SEO. Beberapa tool dapat digunakan untuk mengetahui keyword yang sedang boomig dan menemukan kombinasi kata kunci yang tepat tersebut. Struktur blog yang tidak rapi, tulang punggung website, digunakan untuk mengindeks konten dan relevansinya dengan pencarian. Jadi, secara alamiah, struktur situs yang tidak tertata dengan baik merupakan tanda-tanda yang tidak baik dalam rangking hasil pencarian. Dengan mempunyai situs yang terstruktur dengan baik, search engine akan mengetahui tujuan dari situs kita, lalu merangking situs kita lebih tinggi berdasarkan berapa banyak konten terkait terindeks. Menggunakan image untuk menggantikan teks, Search engines tidak dapat membaca gambar teks, seperti logo perusahaan, bullet daftar produk dan jasa. Jadi jika situs anda menggunakan gambar dalam menyediakan informasi untuk pembaca, jelas tidak akan terbaca oleh search engine. Sebisa mungkin gunakan teks dalam konten, kecuali gambar pendukung yang benar-benar diperlukan. itupun hendaknya diberi alternatif teks (tag ALT). URL tidak mengandung Keyword. Hal ini sebenarnya cukup sederhana namun cukup manjur untuk meningkatkan visibility situs kita di mata search engine. Namun, biasanya untuk situs-situs “personal” kita tidak terlalu peduli dengan adanya kata kunci dalam url, kecuali url tersebut dibuat untuk tujuan khusus (misalnya untuk ikut kontes SEO). Tapi, situs yang mengandung kata kunci dalam urlnya akan mempunyai posisi yang lebih baik di mata search engine untuk kata keyword sama. Sebelumnya saya mengucapkan terima kasih karen anda telah mengunjungi blog saya, pada kali ini saya akan membahas bagaimana cara memulai proses seo dari awal pembuatan website secara aman. Aman yang di maksud agar website yang dioptimasi terbebas dari ancaman balck list dan memiliki fondasi yang kuat untuk dikembangkan lebih lanjut. Tapi tidak menutup kemungkinan juga untuk diterapkan pada website yang sudah online sejak lama, meskipun tidak 100% bisa diaplikasikan. Pada langkah pertama anda diharapkan bisa memilih keyword yang tepat sesuai dengan content atau isi web yang anda buat. Keyword yang tepat adalah keyword yang tingkat persaingannya paling sedikit, namun memiliki audience yang paling banyak. Untuk memilih keyword-keyword ini tidak disarankan dengan sistem tebak menebak. Gunakan alat bantu atau tools khusus untuk recearch keyword, seperti Word Tracker (www.wordtracker.com). Tools ini akan bisa memberikan informasi yang akurat mengenai keyword-keyword yang relevan dengan content yang anda cari, lengkap dengan tingkat persaingan dan jumlah orang yang melakukan pencarian dengan keyword tersebut. Kesalahan memilih keyword merupakan kesalahan fatal dalam seo, jadi anda harus cermat dalam hal ini. Domain adalah investasi yang sangat berharga. Jika anda berhasil membangun sebuah website yang berkualitas, harga domain anda secara otomatis akan melambung. Untuk keperluan seo, usahakan memilih domain dengan melibatkan keyword yang sudah anda tentukan sebelumnya. misalnya jika website anda menawarkan jasa sertifikasi, usahakan menggunakan kata sertifikasi pada domain anda. Meskipun faktor ini bukan merupakan keharusan, namun saya melihat perannya dalam menentukan rangkink di search engine masih sangat besar. Saya tidak mengatakan anda harus memakai semua keyword pada domain yang akan membuatnya terlalu panjang. Tapi usahakan memakai salah satu kata kunci utama. SEO adalah proses bertahap, dan setiap tahap harus anda lakukan secara benar. Sebab untuk mendapatkan rangkink yang baik bisa membutuhkan waktu berbulan-bulan bahkan lebih dari setahun, tergantung dari tingkat persaingan keyword anda. Untuk tahap awal, siapkan minimal 3 halaman yang memiliki content unik, bukan jiplakan. Anda harus membuat content ini sendiri sesuai dengan informasi yang anda tawarkan di web. Saat ini terdapat banyak artikel gratisan di internet yang bisa anda gunakan sebagai content. Namun artikel semacam ini tidak saya sarankan. Google dan search engine lainnya bisa menditeksi mana content yang asli. Dan mereka hanya memberikan rating yang baik untuk content yang unik dan tidak terdapat di website lain. Jadi untuk tahap awal, anda harus menyipkan setidaknya 3 halaman unik yang saling berhubungan atau di-link satu sama lain. Pada saat anda menulis content, jangan lupa untuk menggunakan keyword-keyword yang sudah anda pilih sebelumnya. Gunakan keyword ini secara wajar hingga content tetap enak untuk dibaca. Jangan terlalu memaksa penggunakan keyword secara berlebihan. Selanjutnya dari halaman index atau homepage, pasang satu link yang mengarah ke wikipedia (www.wikipedia.org), sesuai dengan topik utama website anda. Contoh, jika website anda membahas tentang komputer, buatlah link ke halaman ini dari homepage anda : http:// en.wikipedia.org/wiki/komputer. Link ini berguna untuk memberikan ide pada search engine mengenai topik apa yang anda sediakan di web. Wikipedia.org adalah resource penting yang sangat dipercaya oleh search engine, jadi pemasangan link kesitus ini akan sangat membantu website anda. Untuk tahap awal, jangan sekali-kali memasang link ke website yang tidak ada hubungannya dengan konten website anda. OK, sekarang saya anggap anda sudah memiliki sebuah website dengan 3 halaman yang saling berhubungan, satu link dari halaman depan ke wikipedia dan tentu saja tanpa broken link. anda juga harus menggunakan HTML standar dengan design web yang tidak terlalu berat. HTML standar yang saya maksud adalah HTML yang bisa di baca search engine, bukan berarti anda tidak boleh memakai script PHP atau sejenisnya. Script server side seperti PHP atau ASP juga menghasilkan HTML sebagai output. Hindari pemakaian teknologi AJAX untuk tahap-tahap awal. Selanjutnya adalah mendapatkan sebuah inboundlink, yaitu link dari website lain yang memiliki topik sejenis dengan website anda. Saat ini anda hanya memerlukan satu link, tapi usahakan link tersebut dari website yang memiliki pagerank (en.wikipedia.org/wiki/pagerank) tinggi. Contohnya adalah link dari DMOZ (www.dmoz.org), Yahoo Directory (dir.yahoo.com), dan lain-lain. DMOZ mungkin tidak dapat anda harapkan untuk bisa memberikan link dengan cepat. Mereka menggunakan editor volunteer yang bekerja sesuai dengan waktu senggangnya. Anda bisa melakukan submite ke directory lain yang sudah cukup terkenal. Setelah website anda online dan mendapatkan satu inbound link yang berkualitas, tunggu dua minggu sambil menyiapkan konten tambahan. Mengapa menunggu 2 minggu? Langkah ini untuk memberikan kesempatan kepada search engine agar mengenali domain anda dari link referer atau inbound link yang sudah anda dapatkan sebelunnya. Dengan cara ini website anda akan masuk ke listing search engine tanpa harus melakukan submission langsung ke search enggine yang bersangkutan. Keuntungannya adalah search engine akan dengan mudah mengetahui dari topik dari website anda, sebab linknya ditelusuri dari website berkualitas dengan topik yang relevan. Namun apabila dalam jangka waktu 2 minggu website anda belum terlisting di search engine, lakukan submission langsung melalui form submit di search engine tersebut. Tambahkan setidaknya 2 halaman baru berupa artikel atau halaman pendukung dari countent utama anda. Selanjutnya tunggu 2 minggu lagi sampai website anda terlisting. Perlu saya ingatkan disini, bahwa langkah-langkah ini sengaja saya susun secara bertahap agar perkembangan website anda di search engine terlihat wajar. Anda bisa saja mendapatkan ribuan link dalam waktu sehari dengan membelinya di internet. Tapi itu hanya akan menjadi bumerang untuk website anda, sebab search engine beranggapan tidak mungkin sebuah website yang baru online bisa memiliki ribuan inboud link dalam waktu sehari. Jadi kita harus membuat agar perkembangannya terlihat wajar. Ingat bahwa langkah-langkah ini dilakukan untuk membangun pondasi SEO yang kuat untuk jangka panjang. Sebulan sudah berjalan dengan kondisi saat ini lima halaman website anda sudah terlisting di search engine. Sekarang saatnya menambahkan countent yang sudah anda persiapkan sebelumnya. Pertanyaannya, jenis konten seperti apa yang harus anda tambahkan. Countent yang baik adalah cauntent yang bisa mendukung keyword utama yang merupakan fokus dari website anda. Sebagai contoh jika website anda menjual produk-produk alat atau perangkat telekomunikasi, selain memuat informasi produk seperti Sierra Wireless Compass 885, DWL-2100AP, Nokia Classic, sebaiknya ditambahkan artikel yang bermanfaat seperti Dasar CDMA 2000 1x EV-DO REV A, Jaringan Wimax, MSS ( Mobile Satelite System), Public Switched Telephone Network (PSTN) dan lain-lain. Dengan menambahkan konten semacam ini, anda bisa bermain lebih banyak menggunakan keyword-keyword yang sudah di pilih sebelumnya. Penambahan halaman sebaiknya di ataur secara berkala. Anggap saja saat ini anda memiliki 10 artikel baru. Penambahan 2 artikel perminggu sebagai halaman baru akan lebih baik dari pada memasang 10 artikel tersebut sekaligus, dan setelah itu tidak pernah ada tambakan lagi. Seiring dengan penambahan content, pada bulan kedua ini anda bisa mulai mencari tambahan inboud link. Untuk bulan kedua anda bisa mencari sekitar 10 sampai 15 link. Bulan ketiga sampai keenam tambahkan masing-masing 20 link perbulan. Setelah refresh index di bulan keenam biasanya website anda akan mulai tampak di search engine dengan prase 3 kata. Prase adalah kombinasi keyword anda. Meskipun belum dihalaman pertama, tapi dengan langkah-langkah yang konsisten, posisinya akan semakin baik. Memasuki bulan ketujuh, anda bisa mencari kurang lebih 25-30 link perbulan. Jangan melebihi jumlah ini hingga website anda berumur 1 tahun. Angka-angka ini bukanlah konstanta yang harus anda ikuti 100%. Saya mendapatkan angka ini dari percobaan-percobaan yang sudah saya lakukan sebelumnya. Intinya penambahan link secara bertahap dan tidak berlebihan. Bagaimana anda cara anda mendapatkan link-link ini? Inbound link yang baik adalah link dari website yang memiliki countent yang berhubungan dengan countent anda. Web directory adalah tempat yang paling mudah untuk mendapatkan link semacam ini. Web directory biasanya menyediakan kategori-kategori yang beragam, dan salah satunya mungkin relevan dengan website anda. Ada ribuan directory mulai dari yang besar hingga yang baru muncul. Directory critic (www.directorycritic.com) menyediakan ribuan link directory lengkap dengan review dan pageranknya. Anda bisa menemukan ribuan tempat submit disini, mulai dari yang gratis hingga yang berbayar. Cara lain mendapatkan link adalah dengan publikasi artikel, link exchange hanya dengan situs yang relevan, memberikan produk atau service gratis kepada publik, dan metode-metode lain yang tidak bisa saya jelaskan satu-persatu disini. Dengan langkah-langkah diatas saya tidak bisa menjamin berapa lama website anda bisa masuk 10 besar di search engine. Namun dari website yang saya optimasi dengan langkah-langkah tersebut, hasilnya selalu membaik jika dilakukan secara konsisten. Maintenance terhadap countent harus anda lakukan secara berkala. Misalnya dengan penambahkan halaman yang semakin banyak, secara tidak sengaja mungkin saja terdapat broken link yang sulit anda deteksi. Satu broken link saja sudah bisa menurunkan rating website anda di search engine. Jadi gunakan tools broken link checker (www.dead-links.com) yang bisa memudahkan pekerjaan anda. Untuk website dengan jumlah halaman yang banyak, penggunaan sitemap juga akan mempermudah search engine membaca keseluruhan dari countent website anda. Sitemap ini juga bisa dibuat dengan bantuan tools khusus (www.google.com/webmasters/tools/docs/en/sitemap-generator.html), sehingga anda tidak perlu repot-repot membuatnya secara manual. Demikian informasi dari saya tentang tips seo yang aman untuk jangka panjang yang dapat saya sampaikan, semoga berguna dan dapat menambah pengetahuan bagi yang membacanya. WordPress adalah salah satu alat promosi paling kuat yang diperoleh di web saat ini. Hal ini biasanya digunakan untuk membuat weblog untuk internet marketing atau pribadi situs web Anda untuk memasarkan produk Anda. Apa sebenarnya yang hebat tentang WordPress adalah bahwa Anda akan mampu menciptakan baik dari mereka dalam hitungan menit bahkan jika Anda tidak tahu bagaimana Anda bisa melakukan HTML. Unsur penting ke blog WordPress atau website yang sukses adalah kemampuan optimasi Search engine atau SEO. Di sini adalah beberapa saran yang dapat memanfaatkan dalam weblog Anda Marketing WordPress atau situs web untuk membuatnya Search engine optimization mampu. Anda harus memastikan bahwa Anda menggunakan permalink pada situs WordPress Anda. Secara default Anda program perangkat lunak WordPress berisi alamat web internet yang mencakup menandai permintaan dan angka di dalamnya. URL ini tidak ramah bagi crawler mesin pencari bersih dapat terhubung diri. Karena situs ini Anda tidak akan diindeks secepat mungkin biasanya. WordPress Namun, memang memberi Anda kesempatan untuk membuat URL yang disesuaikan untuk masing-masing permalink dan arsip. Hal ini mungkin bagi Anda untuk untuk mendapatkan fungsi ini di bawah panel Administrasi Anda. Semua anda harus lakukan adalah memilih pilihan panel kemudian klik permalinks. Dalam bagian permalinks perangkat lunak pemasaran Anda WordPress Anda memiliki pilihan tanggal dan nama berbasis. Pilihan ini akan menempatkan rincian tanggal, dan judul posting di URL Anda. Untuk Webcrawlers SEO yang terbaik untuk memiliki nama posisi situs web anda di bagian depan ini alamat web. Jadi, daripada menggunakan URL dasar yang terbaik adalah untuk memilih alamat web disesuaikan dan menciptakan link yang memiliki nama situs web anda muncul terlebih dahulu. Tag adalah fitur yang bagus untuk website Anda pada sudut Search engine optimization. Mereka akan memungkinkan merangkak crawler mesin pencari utama bersih ‘melalui situs web Anda lebih sederhana dan selain itu akan akan membiarkan Anda membuat halaman yang tepat untuk tag Anda dan kata kunci. Anda bahkan dapat menginstal Ultimate Tag Warrior Plugin di WordPress Anda. Anda harus memastikan bahwa Anda memiliki judul yang baik pada semua laman web. Sama seperti anda menaruh nama situs pada awal alamat web Anda, Anda akan harus melakukan hal yang sama bersama-sama dengan judul halaman web Anda. judul posting ini yang Anda pilih harus jelas tertulis. Jangan hal ini judul dengan frase kunci yang Anda memanfaatkan untuk fokus pada website atau blog. Pilih kata kunci Anda dengan hati-hati ketika Anda posting dan mendapatkan frasa ini dalam judul posting Anda. Kategori akan memungkinkan Anda untuk mengatur konten Anda. Jika Anda telah permalinks Anda diaktifkan, nama kategori akan menjadi terlihat dalam URL Anda. Inilah sebabnya mengapa sangat penting bahwa Anda hanya mengidentifikasi nama kategori Anda hati-hati. Cobalah untuk memastikan bahwa Anda menggunakan kunci frase untuk menggambarkan kategori Anda dan jangan takut untuk mengembangkan banyak dari mereka. WordPress memberikan Anda kekuatan untuk menggunakan sub kategori dan sub-subkategori sehingga membuat sebagai kategori-kategori yang dapat Anda. Dengan cara ini Anda akan dapat menelusuri fokus Anda pada frase frase kunci tertentu. Selain itu, Anda akan harus menyeberang link ke posting Anda sendiri dan halaman konten Anda. Anda melakukan ini dengan hyperlink kata kunci untuk posting terkait Anda. Anda pasti harus menyerahkan hyperlink ke posting terkait di bawah semua posting Anda. Ini akan membantu crawler online yang merangkak melalui website Anda dan mengindeks seluruh posting Anda. Setiap kali Anda posting atau mengedit baik posting atau halaman blog WordPress Anda dapat memberitahu berbagai situs yang berbeda yang anda telah memperbarui blog Anda. Hal ini sangat penting bahwa Anda menggunakan langkah ini. Google memiliki alat untuk Anda yang disebut sebagai Google Sitemaps. Alat ini akan memungkinkan Anda untuk mengindeks situs Anda dan memungkinkan Anda memberitahu Google halaman yang paling penting. Bonus Tip #1 – Are Comments Enabled? Unfortunately, some themes (including the WordPress Default Theme) put the sidebar section titles in <h2> tags. Although this makes sense from a strict structural point of view, it also gives irrelevant sidebar headers (“Categories,” “Archives,” “Meta,” etc.) equal weight with your SEO-important post titles. Stay tuned for the “mega-tip” later this week! If your eager to try these techniques out, download our free WordPress SEO Theme, Small Business SEO. We’re back with another list — this time we’re going to take a look at well designed, standards-compliant E-commerce stores. These are tricky sites to get right and design can give way to conversions, which is after all, the reason they are there — to make money. Sign up for professional 1Y0-A05 web designing course and learn how to build powerful site to promote your business. Become expert in design work using 350-029 design guide and 70-646 video tutorials. Anyone who runs a successful website knows the value of search engine optimization. A good SEO tool kit can turn a good website into a profitable website by attracting the right kind of targeted traffic. But, how do you SEO a CMS site such as Joomla? With Joomla Extensions! Extensions is term used to refer to any number of Joomla components, modules and plugins. If you have a Joomla website, you’re going to want to make sure that you’ve properly optimized it for search engines and have the appropriate SEO tools in place. Below I’ve listed the top five SEO extensions for Joomla. 1. Joomap. One of the first and most important things you can do when building your site is to make sure to create a sitemap and submit it to all the major search engines. The extension shows all the menu structure, content categories and sections and can also create a Google Sitemap list. 2. SEOSimple. SEOSimple is one of the most used SEO extensions by Joomla users. On the front page, you can choose whether to use automated meta data based on what displays on the page or manually insert meta data. Other features include the ability to customize the meta data for each page. 3. JoomSEO. JoomSEO has a ton of different features, but most notably, it dynamically makes the content more search engine friendly. 4. Joomla SEO/SEF Component. The Joomla SEO/SEF Component mainly makes your urls more search engine friendly. Instead of your urls being a mixture of numbers and letters, it allows for more understandable urls. 5. J!Redirect301. This extension works just as it sounds. The plugin redirects your domains to one domain so that only one version of your site is indexed.